Be the first one to write a review for this product. New SofLens® 1-day ( daily ) disposable Toric for Astigmatism has been designed to deliver a more complete visual performance, providing all-day comfort using Comfort Moist™ technology. With advanced Lo-Torque™ design and aspheric optics, the new lens givfes wearers clear, stable vision achieved through its predictable orientation and rotation. 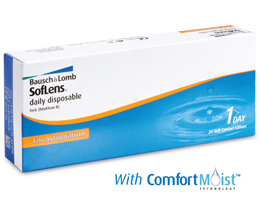 New SofLens® 1-Day ( daily ) disposable Toric for Astigmatism has been designed to deliver a more complete visual performance, providing all-day comfort using ComfortMoist™ technology. With advanced Lo-Torque™ design and aspheric optics, the new lens gives wearers clear, stable vision achieved through its predictable orientation and rotation. The innovative aspheric optics are designed to help improve contrast of the retinal image and consistently reduce spherical aberration across a range of lens powers. Reduced mass design and non-ionic material provide a wettable surface for outstanding all day comfort. The hilafilcon B polymer reduces tearing & the ergonomic blister pack has been designed for easy, smooth lens removal. 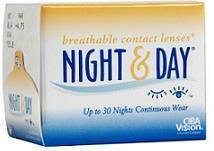 Get Your New SofLens® 1-day ( daily ) disposable Toric for Astigmatism Today !